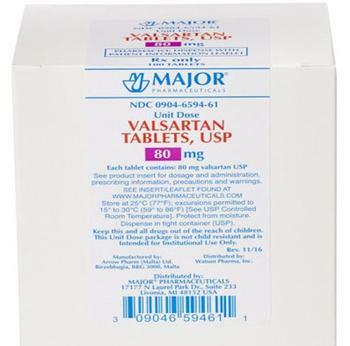 Major Pharmaceuticals is recalling all lots Valsartan which was supplied by Teva Pharmaceuticals and labeled as Major Pharmaceuticals and is used to treat hypertension (high blood pressure) and heart failure. Trace amounts of an unexpected impurity -- N- nitrosodimethylamine (NDMA -- were found in an active pharmaceutical ingredient (API). NDMA has been classified as a probable human carcinogen as per International Agency for Research on Cancer (IARC) classification. Consumers with questions regarding the recall may contact Major Pharmaceuticals customer support at (800) 616-2471, Option #1 Monday through Friday, 8 a.m. – 8 p.m. (EST).